As I said in that post, the Feast of Trumpets has much to do with remembering the giving of the Law. Focusing on the law should put us in mind of how miserably we have failed at the keeping of it. Once the law has shown us our need, then the atonement shows the solution. The Day of Atonement has to do with redemption, that is the buying back, or payment made for our sin. As Hebrews 9:7 says "But into the second went the high priest alone once every year, not without blood, which he offered for himself, and for the errors of the people:"
This day was a foreshadowing of the great payment which would be made for sins by Christ as our great high priest which we see in Hebrews 9:11-12 "But Christ being come an high priest of good things to come, by a greater and more perfect tabernacle, not made with hands, that is to say, not of this building; Neither by the blood of goats and calves, but by his own blood he entered in once into the holy place, having obtained eternal redemption for us." Eternal redemption! That is certainly something worth spending some time remembering! Quoting from the SuperFlow operators manual: " In it's simplest form, flow testing consists of blowing or sucking air through a cylinder head at a constant pressure. Then the flow rate is measured at various valve lifts. A change can be made and then the head can be re-tested. Greater air flow indicates a flow improvement. If the tests are made under the same conditions (emphasis ours), no corrections for atmospheric conditions or machine variations are required. The test results may be compared directly." 2. Test pressure used - SuperFlow has a chart in their operators manual for converting flow figures from commonly used test pressures to other commonly used test pressures. Flow figures taken at 10" test pressure must be converted in order to be compared to flow figures taken at 25" test pressure. 3. With or without intake manifold on intake port - Obviously a flow test done with a restrictive stock manifold on the head will not show as much cfm as one with a very unrestrictive manifold. 4. With or without carb on intake - Same idea as with the manifold, in order to compare apples to apples the flow figures you are comparing need to be taken through carbs that flow the same. 5. Type and design of radius entry on intake - If testing is done without a carb or manifold a radius entry should be used at the port entrance. The shape and size of this radius entry can effect flow figures. If an intake manifold is used on the head, it too should have a radius entry. 6. With or without pipe on exhaust - Adding a piece of pipe to the exhaust when using a SuperFlow 110 does not seem to effect the results much, while on the SuperFlow 600 with its higher test pressures it makes a large difference. 7. Design of pipe on exhaust - flow figures will increase from having a "bell mouth" or "flare" on the exit end of it. 8. Operator methodology - The way in which the operator does the test can also play a big part in results obtained. 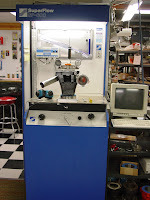 The angle that you read the manometers from will affect the results, as well as how quickly you take your reading after turning the machine on, to name just a couple variables. All of these variables can be minimized to the point of being negligible if you are comparing only heads that are checked on the same flow bench. In other words, "Cousin Roy's Backyard Porting Shop" (fictitious name, I hope) with his SuperFlow 110 may do just as good a porting job as Mr. Hi-Tech in LA (who uses a SuperFlow 600 with all the bells and whistles), if he has done his homework and learned from his testing, porting and re-testing. The trouble is, it may be hard to know how his work compares without testing Mr. Hi-Tech's heads on Cousin Roy's bench or visa versa. 1. Spend your money with a shop you can trust. Ask around. If possible talk to someone who has used their services before. 2. Is the shop's reputation based on advertising or on results? Anyone can claim to be the best cylinder head porter in the business. The truth be known, any GOOD porting shop is capable of putting out quality work. There is a limit to how much any valve size is physically capable of flowing. Most talented cylinder head porters should not be too far apart on their flow figures for the same head and valve size. Much of the difference in their flow figures may be attributable to the items listed previously with the heading "under the same conditions." 4. You get what you pay for... sometimes. A mediocre porting job will probably flow about halfway between a stock head and a well ported head. Hopefully the price will reflect that difference. Don't expect top notch work for a dirt cheap price. On the other hand there will always be people out there who are more than willing to charge premium prices for mediocre work and make up for it with bravado. See # 1 above. SuperFlow says there is only a 1% difference in the flow loss due to wall friction between a sand cast and a polished surface. Shine does not necessarily equal airflow. This past Sunday morning our pastor delivered a sermon about the "Feast of Trumpets" or Rosh Hashanah, which took place on September 13th. A couple verses in particular caught my eye. Leviticus 23:24 "Speak unto the children of Israel, saying, In the seventh month, in the first day of the month, shall ye have a sabbath, a memorial of blowing of trumpets, an holy convocation." "And it came to pass on the third day in the morning, that there were thunders and lightnings, and a thick cloud upon the mount, and the voice of the trumpet exceeding loud; so that all the people that was in the camp trembled. And Moses brought forth the people out of the camp to meet with God; and they stood at the nether part of the mount. And mount Sinai was altogether on a smoke, because the LORD descended upon it in fire: and the smoke thereof ascended as the smoke of a furnace, and the whole mount quaked greatly. And when the voice of the trumpet sounded long, and waxed louder and louder, Moses spake, and God answered him by a voice." Of course, you know what closely follows in Exodus chapter 20. The giving of the law. The ten commandments. Now in our simple reading over of these bible verses it is pretty easy to miss what a fearful event this must have been. Thunder! Lightening! Smoke! And most of all the exceeding loud sound of the trumpet. Loud to the point that everyone was literally shaking from fear. And shaking in fear was the correct response! The people were about to have the law given to them. God's standard of holiness! If any of the people were not quaking in fear before they received the law, then they certainly should have been once they did. I have to think that this event is what the memorial of the Feast 0f Trumpets is all about. Of course when most of us think of trumpets in the context of the bible, we think of "the last trump" of 1 Corinthians 15:52. This Feast of Trumpets is also a foreshadowing of that event, I think. Matthew 24:30-31 says: "And then shall appear the sign of the Son of man in heaven: and then shall all the tribes of the earth mourn, and they shall see the Son of man coming in the clouds of heaven with power and great glory. And he shall send his angels with a great sound of a trumpet, and they shall gather together his elect from the four winds, from one end of heaven to the other." Both the memorial and the foreshadowing then have to do with judgement. For it is the law that condemns us, and it is with the return of Christ that eternal judgement will be delivered. But it is also about mercy, for it was an act of mercy for God to give the law that we might realize our sinfulness. And it is only by the mercy of God, through Christ's payment for our sins on the cross, that any of us are saved from the judgement to come! It took all of the willpower that I posses. I really had to reach down deep inside to make myself NOT do something stupid. Though I have never had a drug habit, I am quite sure that the temptation is of the same magnitude. It started when Jason Clampitt called me a about a week ago to remind me that the Kokesh All Harley Drags which he sponsors (and bears the Kokesh name) were coming up this weekend. I had, of course, seen the race on the Grove Creek Dragway schedule, but to be honest I hadn't given it a lot of thought. Since officially retiring from drag racing, I have been on a strip only about a half dozen times, and about half of those times was in my '58 Studebaker Hawk. The newest bike in our household is my wife's '47 Knucklehead. A stock 61 cubic inch with handshift, it's not what many would consider drag bike material. Besides, most every one I know with any sort of antique bike that I might have been able to coerce into racing would be at the antique motorcycle meet in Davenport Iowa for the weekend. But, it would be nice to help support the yearly race. In fact, events like this tend to just disappear if they don't get enough participation. And participation doesn't require being highly competitive. The clincher was probably the fact that it was to be an evening event with the gates opening at 4:00 pm. This would enable me to keep my shop open normal hours Saturday morning. So the 61" Knuckle it would be! This bike has always run very strong for what it is. The motor, which I completely rebuilt back in about 1989, is completely stock right down to the cam,with the exception of the most mild of porting work and a stock later model carb. When I say it runs strong I mainly base that on the fact that it will chirp the rear tire and pop the front wheel about an inch off the pavement when hitting second gear hard (yes, it does have a ratchet lid on the trans). Well, you can't go drag racing with a muffler, so the first order of business was to find a piece of straight pipe to install in place of the muffler that normally resides on the end of the stock reproduction 2 into 1 pipe. I couldn't believe I didn't have a chunk of pipe long enough in my stash of junk parts. I did have an old slash cut 2" diameter muffler that had been gutted though. By welding a short section of straight pipe onto the front of it I had a rather painless "racing" exhaust system. Let's see, a drag bike really needs a velocity stack. That was easy, since I sell them in my eBay store The late Shovelhead Kehein carb that I have on the Knuck has the same bolt pattern as an S&S "B" carb. A little rejetting, and I would be all set! Oh, that's right: any kind of consistent launch would require a tachometer. Luckily I had saved an old Superglide tach from a crashed bike years ago. It still works despite the glass face having been broken and now removed completely. You may be thinking "That's not so stupid, taking an old bike out to the dragstrip just for fun." Yeah, but that's not the part that I really struggled with. The stupid urge that I had to fight off so heroically was the urge to strip all of the excess weight off the bike for the weekend. Stock fenders; way bigger and heavier than needed. Besides I have an old flat fender that could have been shortened up to the bare minimum. Crash bars; dead weight! A little bates style solo would look good in place of the big stock solo with pogo stick! No need for a headlight; its DRAG RACING! I even toyed with the idea of changing the big stock 16" front wheel over to a 19" I have laying around. Of course that would have eliminated my front brake, making it harder to do a smokey burnout. And I did intend to do some smokey burnouts! Well, since I am still alive and able to write, it is obvious that my wife Jane did not kill me, and that means I resisted the temptation to strip her bike down to "racing weight". But let me tell you, it was close at times. Even as late as Saturday morning I was looking at that big old front fender and thinking how much air it would trap! Other than emptying the saddlebags, adjusting the tire pressures (60 in front, 20 in rear), removing the mirror, and tilting the handlebars down as much as possible, I managed to load the Knuck up in the back of our pickup without further modifications. Upon arrival at the track and getting ready to tech in, I discovered that I had left my lace up work boots at home. I had moved them from the "to go" pile over next to a chair to change into them. At the last minute I decided to wear my cowboy boots until we got to the track. Hmm....slippery bottomed boots with a narrow heel were not my first choice for doing a burnout with a rocker (heel/toe) clutch pedal. I momentarily considered not doing any water burnouts, but quickly discarded that thought as counterproductive to the whole purpose of having fun! If you have never done a burnout as part of drag racing, here's the deal. The purpose of the water burnout is to clean and heat up the rear tire for better traction. If you are using a treaded street tire and water stays in the grooves you have probably defeated the purpose. Some guys don't do them for that reason. But when you are running a 61" Knucklehead, the real purpose of the burnout is to have fun and show off! When you see someone doing a water burnout, and they rev their motor but get very little smoke , it is usually due to using too low a gear. The smoke comes from tire speed, not engine speed. The water may do a little cleaning, but is mostly there to enable you to initially break the tire loose. I do my water burnouts in 3rd gear. Now it is a piece of cake to break the tire loose in water by putting both feet on the ground, taking all of your weight off the bike, and holding the front brake on. With a foot clutch however, that is not so easy to do. Since I have the front brake lever on the right side like a late model, I have to work that along with the throttle with one hand. Add to this, the fact that a stock springer front brake is about a half step better than totally useless, and you can see that the burnout was the most complicated thing to do. Getting any kind of braking force on the front required squeezing with all four fingers, which left only my thumb and palm to control the throttle. 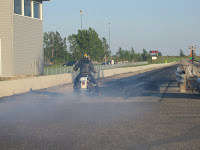 Using the rocker clutch necessitated having the bike leaning slightly to the right when initiating the burnout. The lean meant that the rear of the bike would start to slide out to the left when I dropped the clutch. I also wound up putting much of my weight on the seat. This meant that the extra weight coupled with the limited horsepower of the little 61" Knuck would make the tire try to "hook up" and move the bike forward out of the water. I found that if immediately after dropping the clutch, I got both legs in position so that my lower calves were braced into the front curve of the floorboards, then my feet approximately doubled the holding power of the front brake ( more of a commentary on the weakness of the front brake than the strength of my legs). Once my feet were planted I could feel the rear tire stop trying to grab and looking down I could see the smoke start to roll off the tire. When I felt like I had put on enough of a show, I would let go of the front brake as I sat down on the seat and let it walk out of the water box. Then I had to very quickly get the clutch in and the rear brake on (without letting my pant leg get sucked into the velocity stack) before crossing the starting line. I was also using the front brake at this time, but like I said, it was not a lot of help. After that lengthy description, it frankly doesn't sound like something a person should try to do. Guess its lucky I didn't try to describe it before doing it. Even a normal burn out on a late model street bike is usually enough to get the blood pumping, so as can be imagined, my adrenaline was flowing pretty good by the time I was ready to stage the old Knuckle. Bringing the rpm up to 3500 for the launch proved to be just about ideal giving no engine bog, a little air under the front tire, and just a little tire spin. As usual, banging 2nd gear would momentarily lift the front tire again. 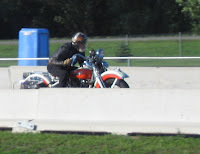 With my chin down on the tachometer and my right leg pulled back to clear the velocity stack, each time I hit another gear it would slide me back an inch or two on the big old Harley solo saddle. By the second or third pass I had realized I was better off winding out 3rd gear rather than shifting into 4th just before the finish line. If that description sounds like I was going really fast, well...I wasn't. 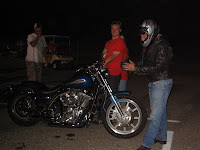 My best time of the evening was 10.221 seconds and 67.02 mph on the eighth mile track. How could it have been so much fun at such slow speeds? There was not a huge turn out of bikes, so there was little or no waiting to make passes during time trials. I think I made more than 10 passes with plenty of time for the bike to cool down a little after about every third pass. Happily this was an eighth mile track so the little 61" was not humiliated as much as if it had been a full quarter. Surprisingly, many of the other bikes did not pass me until I was already in 2nd gear. Most likely they were spinning their tire off the line much more than I was. My reaction times on the starting lights were another bright spot of the evening. I never did have great reaction times like a few racers I know. Since retiring from the pro ranks with its accompanying "pro tree" I had blamed it on not being able to adapt to a sportsman tree. Of course that was not really the case since my reaction times on a pro tree had always left something to be desired. This night however my reaction times were better than they ever have been with my best being a .006! Seems unlikely that old age would bring better reaction times, so maybe it was the extra adrenaline from the whole foot clutch scenario. Eliminations consisted of index racing with a class every .5 second starting with a 7.0 class, then a 7.50 class and so forth up to a 9.50 and slower class. Jason had hoped for enough bikes to break the classes down to every .25 second rather than .5 but the turnout just did not justify it. Since my bike was the slowest one there (I only beat one bike to the finish line all night, and that was because he bogged his engine at the starting line; I did however win a few by opponents red lighting) the eliminations were a bit anticlimactic for me. However, Ken Mlsna, the service manager from American Thunder (next door to my shop) took second in the 9.0 class with his Shovelhead, and Denny Perrier, one of our customers, won the 8.50 class on his hot Panhead. All in all, a great time was had by everyone, and for me personally it will be even harder to keep myself from doing something stupid for next year!